Shays, it’s been a while might have to revisit. extrovert is the least tamed never gets enough snow made, and never groomed. Although Wildcat and Extrovert are about the same pitch, the nod to challenge goes to Ex because it cannot be groomed. I saw Lower Ex groomed below the intersecting trails but never have I’ve seen upper groomed so there have always been snowmaking whales with very steep downhill faces in addition to skier made moguls. Always the last trail to open and I don’t think they’ve made snow on it the last few years. Lower Wildcat has been tamed by the wench cat and will almost always be groomed unless you catch it right after the snowmaking whales are groomed out. On a powder day or a soft snow spring day bumps will be formed, of course. Double fall line so skier’s left skis different than skier’s right. Lower has been opened from the first day of the season since reopening. True north facing, gets very little sun. Perhaps skier’s right of Lower will be allowed to bump up if there is enough natural snow. Since Laurel reopened there has not been enough natural to make it skiable. It has been a while since I skied Shays and it was late season with soft bumps. It didn’t seem as steep as Wildcat or Extrovert. They have new snowmaking on both upper and lower shays from what I understand. Hopefully that means they can let one side of shays get well established moguls this year while still grooming half of it. Might add a new factor in the discussion. Can’t say I’ve really noticed the double fall-line on Wildcat on the 3 days I’ve skied it. Definitely notice it on Extrovert though. I’m guessing Wildcat also slopes to skier’s right? The Shoe put some of the new snowmaking hardware on Lower Shays which should permit an earlier opening and better conditions through the season. Much of the time in the past few years one-half of Shays has been groomed and the other half left natural. I would anticipate a somewhat changed Shays due to better snow conditions/surface! NEW fan guns are on both upper and lower Shays. They are all steep runs., like Jim K I have skied lower wildcat and shay’s only a couple of times each. For many years I skied Extrovert at every opportunity. To me, the aesthetics of steep runs are more memorable and more worthy than steepness alone. I always loved the rhythm and spacing of runs at Ex. There were about 3 different llanes and you could mix and match as you wished. Bumps always form in the same places and reach the same size. Groom the run and the old familiar bumps and lines are back to normal in a few days. This means that a great bump run like Ex will always be there if management has enough sense to leave it alone. On the other hand a bump run that does not have aesthetics will never acquire them unless the run is bulldozed and reconfigured in the off season. I have never known this to happen. Correct me if I’m wrong, but I had always heard part of Extrovert’s challenge was in that it was at a negative bank - curving right while tilting left. Was supposed to up the challenge factor a bit. ….. negative bank - curving right while tilting left. Was supposed to up the challenge factor a bit. Here is my own personal ranking of the toughest Mid A trails - I’ve skied them all. Extrovert - short of heinous bullet proof ice, the only Mid A trail that can be considered challenging by national standards. Even in good conditions, it has challenge. White Lightning at a Montage. Steepest of them all by my internal gauge, but doesn’t measure up to X, Edit on wrong trail name. Lower Shays. Skied it for the first time this past weekend. Head wall is real fun, but I didn’t see what the hype was about wrt to challenge. Off the Wall. Denis measured its steepness years ago to be decently legit. Whales and bumps make it harder wrt to other runs. Upper Gunbarrel. Would be ranked #2 if it weren’t so short. You can get by w/o a lot of speed control and recover on the flats. Lower Wildcat. Cue the howls of protest from the locals on this rankings. But their offspring ditch the free skiing for Ex when it is open. If you groom it near daily, it ain’t that tough. Boulderdash and Whoopdeedoo at Sugar are also legit. But technically Southeast instead of Mid Atlantic. Boulderdash has a few short sections pushing 38*. Whoops is more around 35, but a little longer with a hard stop at the bottom cat walk that could be really bad if you’re not under full control when you face it. I’m not here to argue what’s more difficult, but upper gun barrel is the only trail in the mid Atlantic I’ve ever skied and then decided never again. I didn’t fall. But the whole time I thought if I did, I was going to injure myself significantly. I do not have the skills to ski anything that steep. Looks like Lower Wildcat is 30-35 deg. Which is what I expected. Similar to OTW. When groomed (which was rare), OTW had little challenge. Dont groom Wildcat, and it is number 2 or 3 on my list. I wouldn’t diss Gunbarrel. It requires concentration to get down it. But as I said, it is too short. White Lightning reminds me a lot of Shays. Long flat runout to a head wall that just drops. Both on lookers right of the lift. WL a bit steeper, Shays a bit longer. No diss on Gunbarrel, just wondered why you would rate a short steep drop that in your word, speed control not a problem. As I stated in my first post in this thread, Wildcat was tamed by the winch cat. The groomers have been lobbied to allow half the slope to bump up but to no avail. As Wildcat skis right now it is possible for solid intermediates to start to ski steep stuff and given the limited snowmaking (acreage wise) I suspect that management prefers it that way. On days like closing day when it was groomed wet then froze I was wishing there were some bumps to turn on. I’m afraid that there will be bumps on Wildcat only after a lot of snow, snowfall we’ve not had since reopening 3 years ago and then only on skiers far right where snowmaking and groomers don’t go. Wildcat use to ski more like Extrovert back in the 1980s. Then again, they use to make snow on Extrovert. None of the natural snow area at Laurel are groomed so there is potential for bumps if we get enough snow that lays long enough for skiers to bump it up. Speaking of Extrovert, a conversation I had with a member of the ski patrol yesterday made me wonder if no snowmaking on Ex was just as much a business decision as it was snowmaking infrastructure problems. According to this person, they were prepared to make snow on Ex but the weather was going warm and wet in the coming days and they feared it would be nothing but ice since they cannot groom it. Ex will always ice up after a thaw and stay that way until snowfall or another thaw changes the surface. That lead me to believe that given the snowmaking problems they had early and the low percentage of their clients that will actually ski Ex, management may have decided that it wasn’t worth the money or risk of losing an intermediate trail that would get high use. Blue Knob had good coverage on their closing day. They never made snow on Extrovert or Lower High Hopes this year. I hope they get their snowmaking issues solved and return both of these trail to regular use. I agree with the assessment on Extrovert - it takes a lot more snow to cover that and make it skiable than any of the others. I thought I heard somewhere in the neighborhood of 3x the snow to open vs a “tamer” trail. I’ve suspected the business decision as well - with as quick as it bumps up and ices up there aren’t going to be many that can ski it. I think for both reasons it’s been why it was the last to open when snow was made. There’s much more bang for the snowmaking buck on other runs. Lower HH needs to get fixed as it’s a great run and needs to be opened. Maybe someone can refresh my memory - why is L66 a double black and LHH only black? I don’t remember them being different other than maybe Lower 66 bumping up and not having snowmaking on it (thus crappier comparative conditions compared to LHH). If both had snowmaking, I’d be hardpressed to call L66 double black. On the rare occassions when I have skied BK, lower rt 66 was definitely bumpier and rockier than lower high hopes. I liked them both but I have always found LHH to be a really fun trail. Lower 66 is also narrower. 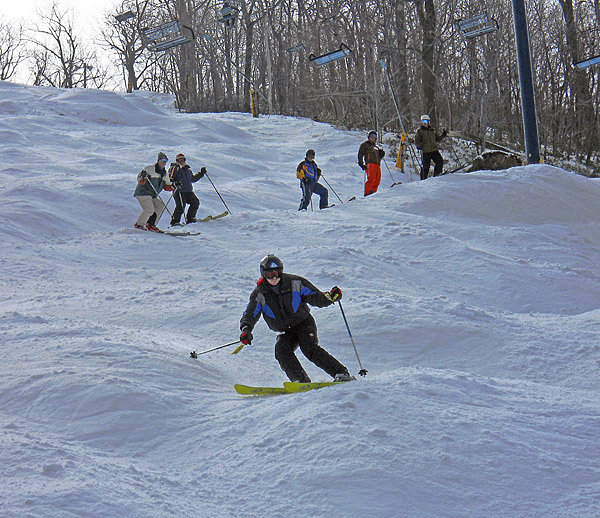 I never had the chance to ski it, but Closed/Not a Ski Trail always looked tougher to me than Wildcat. And as I’m sure you know, it was widened about 20 years ago. As was Lower Shortway, at some point. Extrovert is the crown jewel of Mid Atlantic trails. When it’s been open, there have always been lots of skiers on it. Especially during the old Epic Ski Gatherings. No diss on Gunbarrel, just wondered why you would rate a short steep drop that in your word, speed control not a problem. Arguably the world’s best known bumps run, Gunbarrel plummets 610 vertical metres of continuous moguls down The Face, the mountainside above Heavenly’s California Base Lodge. The fall line is fairly constant and it is basically a case of bend your knees and go. (And go. And go.) The main variable is the size of the moguls and/or the quality of the snow. If you can risk looking up for a moment, there are magnificent views of Lake Tahoe. The run, which has played host to the U.S. Freestyle Championships, is normally groomed only once at the start of the season. 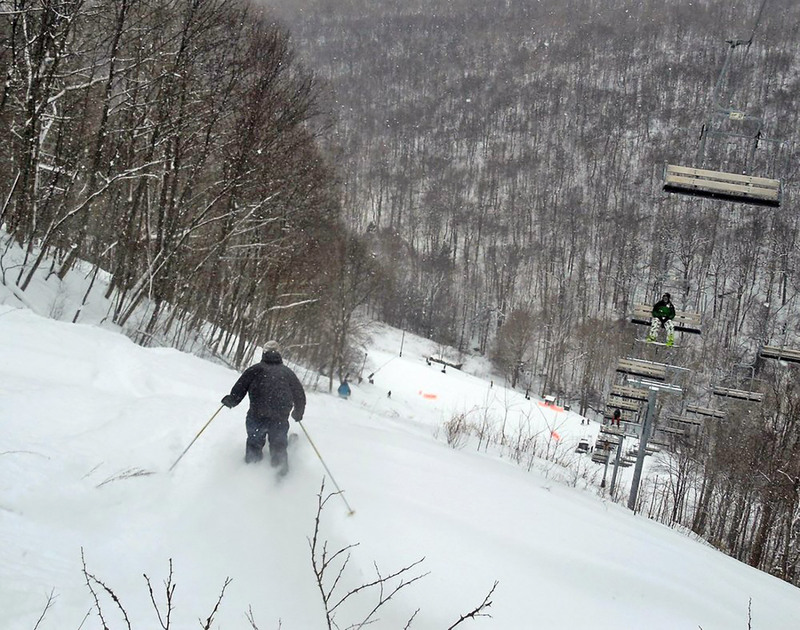 At this point, the run is briefly a great high speed, steep cruiser, but the moguls grow and grow as the season progresses and more people ski it. As good as it gets. I’ve only seen X skiing thos good once out of the 4-5 weekends I’ve made it up there. It’s not as steep but it is narrow and if you get too far to the right you will discover those moguls are really boulders. The liftline is still marked closed. I have to say that or imp will get mad at me. Yes Ex is #1 in difficulty when it is open, I agree. It being closed is the primary reason I’ve been there only once in the past three years and that was last Monday, their closing day. Once they get their snomaking together I’m sure Ex and High Hopes will again be open with snowmaking. Meh. I’ll up your hijack. Gunbarrel at Heavenly is a nice bump run, challenging because of some decent sized bumps and it’s length. But, not scary in the least, esp compared to other Western trails. That was a great gathering. > John, Gunbarrel never scared me but does test your endurance after a long day of skiing. Now I’m back on the east coast when a few winters ago I had the opportunity to ski the Slides at Whiteface. Started on Slide 1 then over to Slide 2 as the ice flow section made us detour then back to 1 to finish out the lower section. Didn’t find it particulary difficult as we had decent coverage the issue was the time it took to get over there and back down to the Summit quad chair. > The only run I remember opting out of was Dynamite at Tremblant. Had the GS skis on and it just didn’t feel right. The headwall was rope staked both left and right so only a small entrance in. Just felt too tight there and only 1 in our group (L3+) skier went in. this says it all IMHO. All others named and those who ski them well deserve respect. There are steeper and longer runs elsewhere in N America, nevertheless it was the training received in my Extrovert years that prepared me to ski at Mt. Washington, NH and many other places. this says it all IMHO. Would now be a good time to remind our listeners that Denis once tele skied Extrovert 63 times in one day? Sir Badass. I hope you’re still getting it in Tahoe and that you’ve found a new “White Grass” out there. disclosure: I took a XC clinic once at WG and you and Chip were the instructors. Old time DCSki posters agree, Extrovert is the King of Challenge and the best practice for tackling the next level of expert inbounds steep and moguled trails found in the big leagues. Although I must say, I think Mt. Washington is in a league of its own. Thanks for the kind words Camp. Exaggeration accepted. Those were the days, late 80s-90s. I’m older now and going for quality over quantity. This place, http://www.tahoexc.org/ is a soulmate of Whitegrass.